One of my blog entries which has received significant traffic involves 19th St. Gym, a local entity which abruptly shut down for several months before recently being bought by a new owner. This post isn’t about the gym itself but rather the search terms which led people to find my post about it. I’ll also discuss the missed opportunities of local gyms to use this as a marketing vehicle. My blogging platform, WordPress, indicates that a total of 24 different search phrases led people to the blog post about the gym. 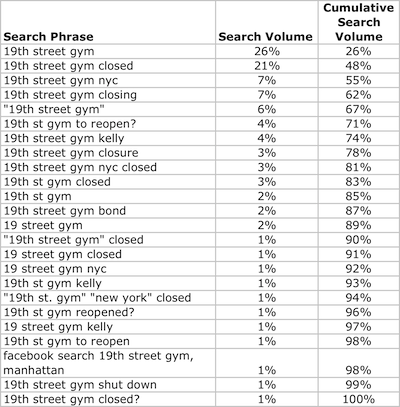 Just 2 of these phrases accounted for about 50% of search traffic: 19th street gym (where my post ranks about #5 on Google’s SERP) and 19th street gym closed, where I rank in roughly position #3. These are the proverbial “big head” terms. The first observation I’ll make is that Google’s organic ranking algorithm worked pretty much the way you’d hope in this case. The blog entry contained a relatively large amount of unique content related to one specific topic; the content was dynamic (because I kept adding updates and readers added relevant comments); several relevant/fitness-related forums linked to the post, adding to its credibility. 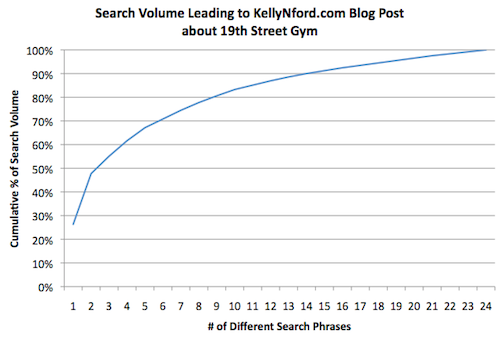 As a result of these factors, Google ranked the post well for the term ’19th street gym’ and related phrases. My second observation is that local gyms are missing an opportunity to bid on the term “19th Street Gym” to offer alternatives (more on that in a minute). The only gym showing an ad is Anytime Fitness, a Minnesota-based outfit whose nearest gym to Manhattan is 18 miles away in West Caldwell, NJ. Exactly 0% of New Yorkers clicking on that ad are going to end up joining Anytime Fitness. On the one hand, you could argue that all these terms are variations of “19th street gym”. On the other hand, if we examine all the variations, this provides a pretty good example of how search behavior tends to work in general. The graph of the cumulative search volume is a classical example of the “big head”, “long tail” phenomena you hear so much about. (My graph is flipped vs the way this is often shown, but the logic is the same). Roughly 8 phrases (33% of all phrases) account for about 80% of total search volume. The lowest volume 11 terms (46% of all terms) have only a combined 10% of total search volume. 3 terms (representing 6% of search volume) contain a question mark. This suggests opportunities for creative search marketers to structure their ad copy (and landing pages) in a way that answers a specific question as opposed to just shouting general benefits or features. Only 5 terms (13% of search volume) include a geographical reference to either NYC or Manhattan, suggesting most searchers may take it for granted that Google will figure out the context of where a search applies. Google deals with this well but not perfectly; it’s something for website owners and search marketers to consider. Note that as of December 2009, Google actually allows sites to tag themselves for geographic relevance (at the country level) to make this more clear in organic results on the SERP. Broad, phrase, exact, negative match? 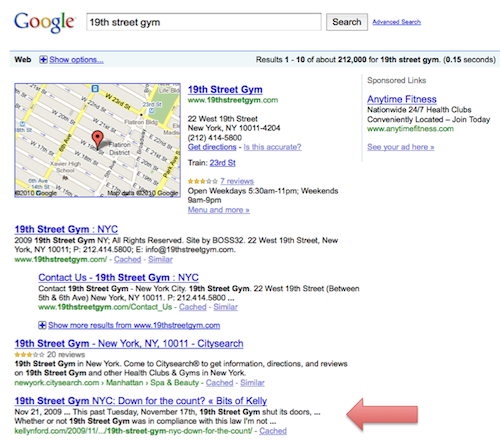 Let’s say you were a competing gym and wanted to use AdWords to reach 19th St. members. Depending on how you structure your keyword, your ad could show for a few, most, or all of the 24 different search phrases. There are pros and cons to each method. Using the default ‘broad match’ keyword phrase of 19th Street Gym would have likely picked up every one of the 24 terms above. 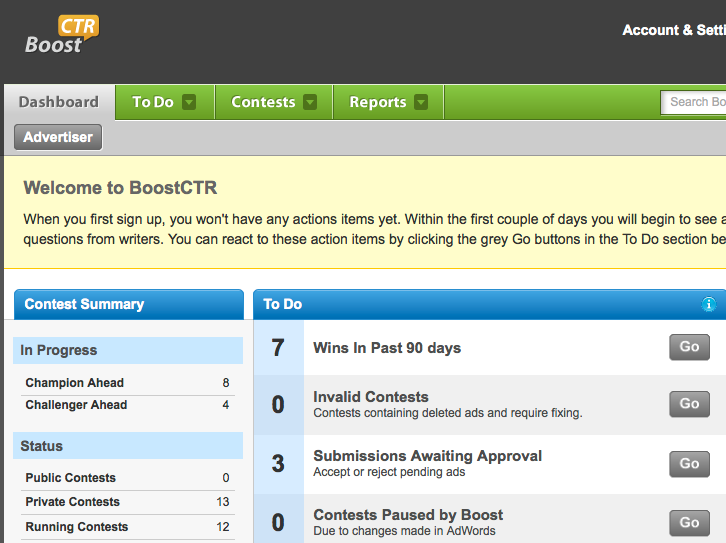 But this has a disadvantage: some of the terms would have probably generated the wrong type of traffic for your ad. For example, people searching for “19th St. Gym bond” were interested in finding out if the gym was in compliance with its NY State bond requirement (it wasn’t), and people searching for “19th St. Gym Kelly” were clearly looking for my specific blog post. Bidding on exact match terms gives you the opportunity to target specific ad copy and potentially have a lower cost per click for the specific phrase than you would have paid with phrase match or broad match. But the specificity means that volume will typically be much lower, and you’ll need to create many more specific search phrases for your account, which takes time and effort. This would have triggered your ad for any search phrase which contained “19th Street Gym”, which was most of the variations. In this example it doesn’t provide a lot of benefit vs. broad match, but in general, phrase matching is a good compromise between the low targeting of broad match and the low volume of exact match. Negative match terms can be used in conjunction with broad terms to eliminate specific phrases you want to avoid, while still generating strong volume. As an example, adding -bond to the broad match phrase 19th Street Gym, would prevent the phrase 19th Street Gym Bond from triggering your ad. Tony Soric wrote a good primer explaining match types in an Oct 2009 Search Engine Land article. Keep in mind the large number of variations in search phrases, even when they contain common elements. Consider ad copy and landing pages which address specific cases. Use match types to find the right balance for your business between targeted leads and volume. Low Google Quality Score? Consider “buying your way” into the party. Quality Score is that somewhat mysterious but very powerful measure Google uses to determine if, how, and when your paid search ads show up on Google and its content network. As Google explains it, a high Quality Score generally means that your keyword will trigger ads in a higher position and at a lower cost-per-click (CPC). The Quality Score is affected by historical click through rate, quality of the landing page, relevance of the keyword to the ad group, and loads of other factors. Knowing Google, there are probably dozens of factors that change and are re-weighted all the time. 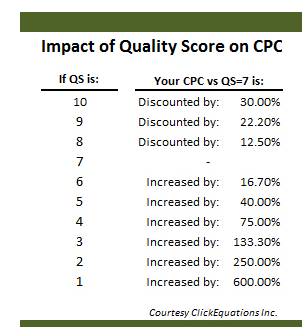 I’ve often come across cases where Google’s “on-the-fly” Quality Score assessment for a new campaign or ad group was very low, resulting in a cpc that was significantly higher than I wanted to pay, let’s say $1.00. Now, I knew that was way more than I was willing to pay an on ongoing basis based on my ROI expectations, but it would have been a mistake to throw in the towel at that point. If I didn’t overpay and buy my way in for at least a little while, how would Google ever realize the strength of my campaign and the great user experience I had in store for its searchers? So if you’re convinced you have a great user experience, but Google’s Quality Score doesn’t yet reflect it, don’t just go home with your tail between your legs. Temporarily buy your way in until Google realizes that you deserve to be in this party after all.